Thank you to Renovation Bootcamp for featuring New Ravenna Mosaics in the Top 10 Kitchen Trends for 2014. To connect with Renovation Bootcamp on Facebook, click here and follow @Sieguzi on Twitter. Tamsin, a hand cut natural stone mosaic, is shown in Calacatta Tia, Verde Luna, Verde Alpi, Giallo Reale, Renaissance Bronze, Rosa Verona, Spring Green, Blue Macauba and Blue Bahia. As seen in Veranda. Acanthus, a hand cut jewel glass mosaic shown here in a custom kitchen backsplash using Quartz, Lapis Lazuli, Blue Spinel and Mica, is part of the Delft Collection by Sara Baldwin for New Ravenna Mosaics. 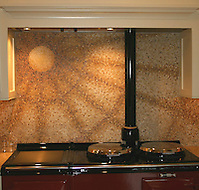 Custom Sunburst backsplash shown in red and gold hand chopped 1cm marble tesserae. 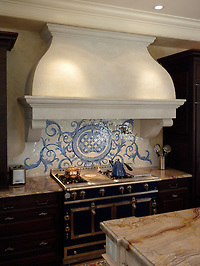 To see more of our kitchen mosaics, click here. Our mosaics are custom made to order so your backsplash possibilities are endless! For prices, samples and design help, click here. Don’t forget to check out what else is new at New Ravenna Mosaics by clicking here and please share your thoughts with us by clicking to gold social media icons below. Your Blue Macauba kitchen backsplash is featured in HGTV Magazine, June 2016, Page 150, yet I don’t find it on your site and when visiting your Delray Beach, FL distributor showroom, they couldn’t find it either. We’re very interested…let us know please if you have this product. Hi Ana! You’re right – we don’t have that image on our site (yet!). That kitchen uses a stone called Blue Macauba – this exotic marble carries a range of turmeric yellow to blue with vibrant blue veining. The bricks in the photo are 3cm x 6cm. Thanks so much for writing to us – we’ll email you to match you with the right showroom for any quotes or samples you need. For any other Blue Macauba lovers – see our post on HGTV Magazine’s feature here!